It’s a Tuesday afternoon in early November at the Mayakoba Golf Classic, and Joaquin Niemann, just a day shy of 20 years old, has mischief on his mind. He grabs a wedge and a ball from his golf bag and takes aim at an open garbage can in the far corner of a conference room at the Fairmont Hotel, the tournament’s buzzing hub of activity in steamy Playa del Carmen, Mexico. “Is that the only breakable thing over there?” Niemann asks, pointing at a framed photograph just beyond the bin. No matter. From a super-tight lie on the carpet, he clips a spinning, low-flighted pitch that sails across the room, rattles off the back of his target and drops into the trash. Swish. Niemann feigns an uppercut fist pump as Sam Burns, standing nearby, shakes his head, laughing. It’s a youthful moment in a scene filled with them — but that’s the idea. Burns, 22, and Niemann are waiting for another Tour young gun, Cameron Champ, 23, who’s lost somewhere on the Fairmont’s sprawling grounds. “No worries,” Burns says of the brief delay. “I’ve literally got nowhere to be.” Life is good for these three. For Niemann, who earned his Tour card last summer after competing in just a handful of sponsor exemptions; for Burns, who stared down Tiger in the final round of last year’s Honda Classic; and for Champ, whose eye-popping power yielded his first Tour win, at the Sanderson Farms, just weeks before the Mayakoba. Golf fans know the roll call when it comes to the PGA Tour’s young stars: Spieth, Thomas, Koepka, et al. But there’s young, and then there’s young. A new wave of stars is entering its first full year on Tour, and they’re here to win. Niemann, Burns and Champ are among those on the brink of Tour success — and all the changes that come with it. It’s why we’ve brought them together at a low-key, off-season Tour stop in this sun-soaked resort town: To chart their journey to this moment. To gauge where they’re going. And, of course, to find out who’s got the badder pickup truck. These three will be on your TVs for decades to come. Joaquin, let’s start with you. Joaquin Niemann: Oh, no. What is your first golf memory? Niemann: A plastic golf club — I was swinging it around inside the house. I was two or three. Sam Burns: You remember that? Two? Niemann: No, but I have pictures. How about you, Cam? Cameron Champ: It’s about the same for me. I was two years old, my grandpa got me plastic clubs, and I went from there. Burns: Mine was different. I have a brother who’s eight years older and a sister who’s nine years older. My first memory with a golf club is trying to chase my brother and hit him with it. You know how older siblings can be. But I’d go out to the golf course with him and my dad, and that’s how I got started. When did you really get serious about the game? Burns: I played a lot of sports growing up. Football, baseball — the big sports. Basketball, a little. Going into high school, I had to decide if I wanted to play golf or football, and I thought I’d have a better chance playing golf. Niemann: I started playing a lot of soccer in school, but I also played golf. When I was 15 or 16, I switched to a small school, where you go from 8:00 to 11:00 in the morning, then you do what you want. I didn’t study anything. [Laughs] Just played golf. Champ: It’s a progression. When you’re 12 to 16 years old, it’s really just about maturing as a player and, obviously, as a person, too. Champ's PGA Tour comp? Probably Brooks Koepka...but he doesn't like to compare his game to anyone. Let’s go back to the start of 2018. None of you had your Tour card. What was the road map? Burns [to Champ]: We played the final round of Q School together, right? Champ: Yeah. Burns: I remember on, like, hole... [Champ bursts out laughing.] You know what I’m talking about! Champ: When you chipped in on the par 5? Burns: Yeah, I chipped in the water! We were pretty for sure inside [the cut line], then I chipped it into the water on a par 5. Now I’m, like, one outside the cut line, but I went on to birdie the next five holes [and get Web.com status]. Champ: Great comeback. Joaquin, you were able to secure your Tour card by earning enough FedEx Cup points in your sponsor exemptions — the same way Jordan Spieth and Jon Rahm had done it. Niemann: Yeah, it felt pretty good. My goal at the beginning of  was to get into the Web.com Tour finals by the seven invites I’d have on the PGA Tour. My first event went really well — I finished sixth. But I knew it was going to be really tough. I just kept thinking about the goal to get to the Web.com Tour finals and try to get my card from there. More events came and I kept playing good. Once I finished [T5] at the Greenbrier and secured my card, it was a really nice feeling. Did you throw a party? Niemann: Oh, nooo. I’m too young. [Laughs] Is it a disappointment when the sponsor exemptions don’t work out the way you want? You know you’re going to earn seven exemptions into Tour events. How important is it to seize those opportunities? Burns: I don’t know. Obviously, [without status] your starts are limited on the PGA Tour. You know that. You can feel a little added pressure. You’re trying to not think about it, but you know you have to perform in five to seven starts, whereas other guys are playing 30-35 events. I don’t know about Cameron, but for me it was great having the Web.com Tour as a consistent place to play. There are a lot of guys who come out of school and don’t make it through Q School and have no place to play. Knowing we had a secure spot every week was nice. Champ: I’d definitely agree with that. It’s huge knowing you have a place to play for a year, to develop as a player coming out of college. Professional golf is a lot different than college and amateur golf. It’s two different worlds. How so? Champ: Everything. Travel...you’re by yourself... Burns: The atmosphere of it. Champ: And this is your career now. You’re not playing for your school, you’re playing for a lot more than that. Sam Burns's game is well-rounded. When his putter gets going is when he's lethal. How about the Web.com Tour compared to the PGA Tour — what are the biggest differences? Burns: I’d say everything is just magnified by 10. Champ: Yeah. Burns: The crowds. The golf courses are tougher. Champ: Right. Burns: You play well-known courses like Pebble and Torrey Pines. Also, growing up, you know so much about the PGA Tour. You watch these guys, and then you’re out here with them. That can be overwhelming. Through all of this uncertainty before you finally get to the bigs, how do you stay confident? Champ: Looking back on it, I think the Web.com Tour was a lot better for me and my preparation. It’s a year-long thing, so you get a full season under your belt. You deal with pressures. Burns: It’s where I learned how to win. Champ: Yeah, you learn how to win. Good momentum, bad momentum. Stuff like that. I think it helped me dramatically. Burns: I agree. I was close to getting my card through the [exemption] starts, but I think it was kind of a blessing for me to not get it. At the time I didn’t think so, but looking back on it, having a year on the Web definitely helped me figure out who I was as a player — more than college or amateur golf. splash — when the golf world at large took notice? Burns: Mine has to be playing with Tiger in the final round of the Honda. [Burns bested Woods with a bogey-free 68.] Niemann: I remember watching that. Champ: Oh, yeah, I was watching that on TV. Niemann: I was watching Tiger, not you. [Laughs] Burns: Yeah, I just happened to be there, too. It was insane, just the whole atmosphere. How many people were watching. For me, I kind of felt like a fanboy at times, because I’d catch myself watching him. I’ve watched about every shot of his growing up. It was kind of surreal, like a dream at the time. Did you sleep the night before? Burns: I was definitely nervous leading up to it. But once we got out there, after a few holes, it’s kind of just another round of golf. I settled into it. He talked a lot. I was kind of surprised how much he shared with me. It was really cool. What about you, Cam? Champ: I’d say my splash was [the 2017 U.S. Open at] Erin Hills, because of what it led to. Just the experience alone helped my game rise. Burns: Yeah, I was watching. Niemann: I played Erin Hills, too, but missed the cut. I remember seeing you on the leaderboard. Burns: You were, what, eighth going into that weekend? Champ: Yeah. I played well the first two days; the last two I didn’t really play well. How about your breakout, Joaquin? Niemann: When I first turned pro, I wanted to know what it was going to feel like. I didn’t know if I was going to have a good week or not, but I played Valero [in 2018] and finished sixth. It would have to be that week. Do you guys have mentors on Tour? Niemann: I’ve been lucky. I’ve been hanging out a lot with Sergio. I’ve played a lot of practice rounds with him, including at the Masters. I don’t know if there are many things that mentors tell you to do that make you better, but Sergio told me to enjoy the game. Whatever you do, just enjoy it. Burns: Yeah, they’ll definitely make you feel more comfortable, even if it’s as simple as where to go when you get to a place. You have no idea where registration is. You’re walking around a new club, you don’t even know where the range is, you don’t know where the putting green is. At times you can feel like you’re lost. I got here this week and I had no idea where to go. I was walking in circles. Niemann's mentor, Sergio Garcia, is also whose game his is so similar to. 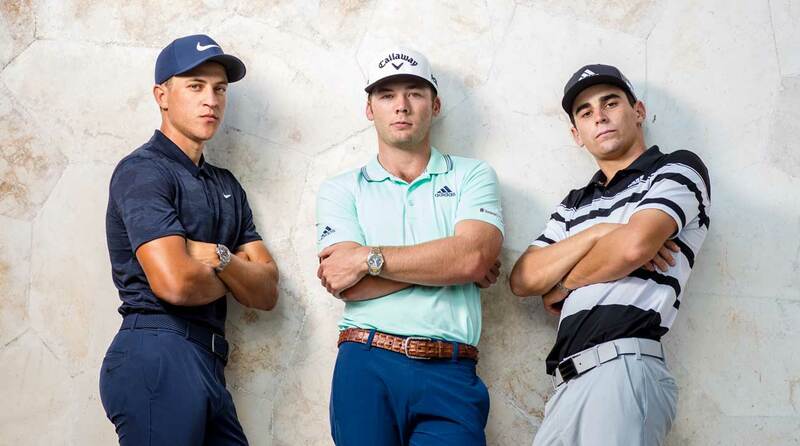 All three players on set at once made for a boisterous photoshoot. You’re a year into the Tour life. What’s been your favorite part of the experience? Burns: There’s not a lot of guys out here [our age], so just to share these experiences with one another is pretty cool in my opinion. Champ: I know a lot of guys who are not out here. A lot of them are very good players. For us to be able to do this, to be out here and have status... Sometimes I take that for granted, but when I put it in perspective it’s pretty cool stuff. Burns: I mean, how many 19-year-olds are there on the PGA Tour? One? Niemann: For one more day! [Niemann turned 20 the following day.] You’ve each been successful at every level, but have there been moments of doubt along the way? Burns: I think golf is always trying to do that to you; trying to get you to second-guess yourself. You have to be mentally strong to be out here. These are the best 125 players in the world. You’ve got to believe in what you’re doing. What are you learning right now that you weren’t working through a year ago? Niemann: When I was an amateur, I didn’t have a lot of weeks playing in a row. Now, I’m playing really often, so I have to be really careful not to practice too much. I have to try to be more consistent every week. You’ve got to figure out a way that works better for you every day. Burns: You have to be more efficient with your time. Champ: Extremely. I learned that one the hard way. The first few weeks on the Web.com Tour I really didn’t have a day off. I was just worn out, and I didn’t play too well. You have to find something that fits you: when to practice, when to rest... Burns: When you go to the golf course, you’re going to do your work. Champ: And then you get outta there. Burns: Especially here, when it’s 212 degrees. Longtime buddies, Champ (left) and Burns (right) will often play practice rounds together. Cam, at the Sanderson Farms event, what did you learn about winning on the Tour level? Burns: You don’t want to ask me that? [Laughs] Champ: I felt like I proved that I was good enough. Obviously, I played really well, but I had a rough front nine on Sunday and gave back a four-stroke lead. But I learned to never give up, even when I had everything going in the opposite direction. Then I got on a run. Made a few clutch putts to cap it off. Niemann: That was a pretty good birdie on 18, from under the trees. Champ: I wasn’t trying to do that! I was trying to hit it into the bunker, but I remember saying, “If I pull this, it might be good,” and I pulled it. Burns: Hits it to seven feet. Champ: Pulled it just enough. [Laughs] I probably couldn’t do that shot again if you gave me 100 balls. You win, and you get a huge payout: $792,000 to be exact. A year ago, you’re not even playing for money. How do you handle that change? Champ: My team. I don’t make a decision without them knowing, whether it’s financially or anything in that category. Obviously, it’s nice, but it’s also overwhelming because a year ago I was still a college kid. Burns: Yeah, I got $400 a month in college. RELATED: HOW CAMERON CHAMP BECAME GOLF'S NEW 'IT' KID Justin Thomas once told me he buys himself something whenever he wins. For his first win, it was a pair of suede slippers. Do you let yourself splurge when you play well? Champ: A little bit, but I’m not buying suede slippers! [Laughs] Burns: I bought a house, but I don’t know if that’s a splurge. It’s kind of essential to have a place to live. I haven’t really splurged, I guess. I bought a truck. Niemann: You guys buy more trucks than cars. Where I come from, we buy more sports cars than trucks. If it gets a little boring on the back nine of an event, broadcasters can start talking about Cam and Sam’s love of trucks. Champ: Oh, yeah. I’ll say my truck’s faster than his. Burns: Yeah, right! Don’t be lying. Champ: My truck has 300 more horsepower than Sam’s! Burns: Fake news. All right, let’s finish with this. In the world golf ranking, you’re all about the same — 110 to 130 or so. That won’t be your peak, but do you think about your peak and, specifically, where you’re going in your career? Burns: I do. If I wasn’t trying to get to No. 1 in the world, I’d be doing myself an injustice. If you’ve put this many years of work into something and aren’t trying to be the best at it, why even do it? I know these two guys both want to be No. 1 in the world. Niemann: I’m always thinking about trying to be the best I can be every day. If one day I can become No. 1 in the world, it’ll be a dream come true. But I’m always trying to go day by day, and get better every time. Champ: No. 1 is everyone’s goal, but as long as you’re trying to strive for it and get better, that basically will take care of everything else. Even Brooks [Koepka] was saying it: you dream about it, and it’s the most difficult thing — especially at this moment in golf, with so many good, quality players. But you gotta hit your ball and putt it.